Thanks to a collaboration between Valley Grange and Penquis Journey House families from the area have an affordable opportunity for a pancake breakfast, visit with Santa, and a homemade ornament for the family tree! All this for only $3 per person (except under two years old–they are free!) at the Valley Grange Hall on Saturday, December 3rd from 8 AM until 10 AM. Donations of baby and personal care items will be welcome… proceeds and donations will benefit the Penquis Journey House–a maternity group home for pregnant and parenting you women and children experiencing homelessness. For more information about the Journey House call 924-0151. Welcome back, Mrs. Erwin! Thanks to a change in her work schedule Mrs. Erwin will begin bookworming in November… expect some changes to this month’s scheduled readers. 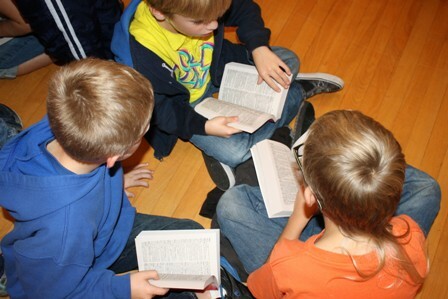 Friday, November 4 — Dictionary Day for SeDoMoCha Third Graders… be at the Grange Hall by 9 AM for a fun time! Note that S.A.D. 4 will conduct their annual assembly honoring Veterans today at 1 PM. This is an event you don’t want to miss. The kids always present a great program with lots of meaning. Friday, November 18 is Dictionary Day in S.A.D. 41. Contact Mr. Boomsma if you are interested in joining the team that travels to Lagrange, Milo, and Brownville with Dictionaries! 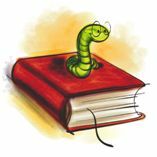 School Vacation November 21 through November 25–bookworms get vacation too! How I love ya, my dear hammy! 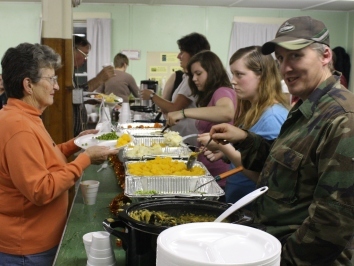 Over 100 people came from surrounding communities to enjoy the Fall Harvest Supper sponsored by Penquis and Valley Grange on October 22. In addition to enjoying good food and fellowship, volunteers and supporters raised over $700 to help Piscataquis Santa “make his rounds” this Christmas. The Piscataquis Santa Project serves needy children, 16 years old or younger who reside within the communities of Abbot, Cambridge, Guilford, Parkman, Sangerville, Wellington, Willimantic, Exeter, Garland, Harmony, Ripley, Bowerbank, Charleston, Dover-Foxcroft, Monson, Sebec, Beaver Cove, Greenville, Kingsbury Plantation, Shirley, or any other community served by MSAD #4, MSAD #46*, or MSAD #68. Information regarding Penquis Programs can be found at http://www.penquis.org. 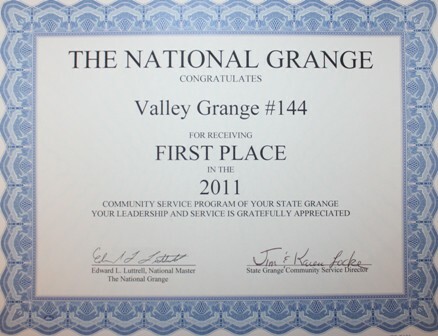 Valley Grange information and events are listed at https://valleygrange.wordpress.com. We’re Number One — Again! The local grange is probably best known for programs geared at children including the Words for Thirds project that puts a dictionary in the hands of every third grader in three local school districts each year. Members also volunteer as “bookworms” and visit Piscataquis Community Elementary School to listen to second and third graders read. All of the grange’s activities are documented throughout the year in a large notebook which serves as a report and the basis for judging. Members aren’t sitting back and basking in the glory of the honor. Third graders from SeDoMoCha will be visiting the Valley Grange Hall on November 4th to receive their dictionaries and a team will travel to Lagrange, Milo and Brownville later in the month to deliver dictionaries to SAD 41 scholars. Boomsma also noted that the grange has recently joined hands with the Penquis Journey House to plan a “Breakfast with Santa” to benefit their program of transitional housing for pregnant and parenting young women ages 16 -21 who are experiencing homelessness or an unsafe living situation. Come Taste A Little of the Summer! Sure it’s getting chilly… but Saturday Night (October 22) you can taste a little of the summer at the Penquis/Valley Grange Fall Harvest Supper! Great food at a great price… a lot of it locally grown! Come at 5 PM while the selection is best! Adults eat for $6, kids 5-12 for $3, and under 5 are free! Even better… the proceeds all go to benefit the Piscataquis Santa Project this year! You can also check out the details on WABI-TV5 News. 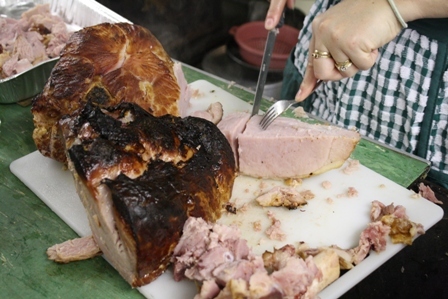 Check out the menu… and bring a couple extra bucks with you to buy a Valley Grange “Meat or Heat” Raffle ticket. The winner gets $100 to help with this years heating or food bill… and the proceeds help Valley Grange continue to operate and support programs like this and our Dictionary Project. While you’re making your plans, enjoy this song about canned goods! Thanks to the Penobscot/Piscataquis Extension Gardening Newsletter for the link to this song! Effective Wednesday morning, October 19th Valley Grange’s presentation of our 1000th Dictionary will be featured on the Dictionary Project’s Homepage. How cool is that?! When it comes to projects like this, the most nearly correct answer is “thousands!” We do appreciate the encouragement and financial support we get from our communities! Thank you! 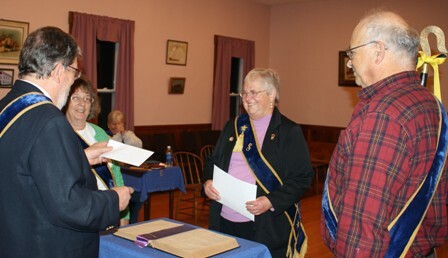 Piscataquis Community Elementary School Third Graders were the audience for Valley Grange’s first Dictionary Day this year and their visit to the grange hall in Guilford included several special moments. One that grangers were particularly proud of and pleased with happened when Kyle Bagley received dictionary number 1000 – representing eight years of the Grange’s support to the Dictionary Project. Sixth graders Billy Griffith, Alexandra Huff, and Adam Bagley came with their well-worn dictionaries from three years ago to explain how their dictionaries have helped them. “I’ll be doing homework at my kitchen table and then be like, ‘Oh, I don’t know how to spell this,’ so I’ll run over to the shelf and it’s right there,” said Billy Griffith. "A steward makes wise use of resources." 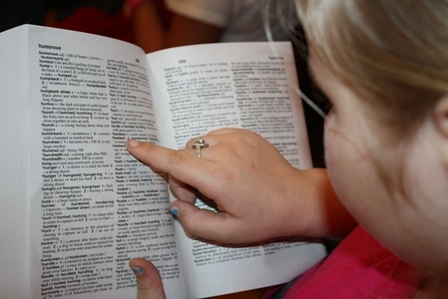 Valley Grange provides the dictionaries to three school districts each year. On November 4 students from SeDoMoCha Elementary school will visit the grange hall for their dictionaries and on November 18 a team of members will travel through S. A. D. 41 to visit elementary schools in Lagrange, Milo, and Brownville. Parents of homeschooled third graders are encouraged to contact their local elementary school so all area students are included. Thanks to WABI–TV5 for their coverage… which you can watch right here! Well, not literally! But we did kick off our fourth year as “bookworms” at Piscataquis Community Elementary School this past Tuesday… amid a comedy of errors that included Mr. Boomsma showing up five hours early and WABI-TV 5’s reporter showing up nearly an hour late! Of course the kids didn’t mind… they just wanted to know when we are going to start. See the WABI-TV 5 story here! 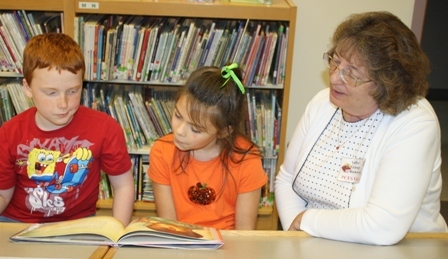 Second Grader Dominic and Third Grader Nyla get ready to read to Mrs. Marsh. Dominic says the horror stories Nyla like give him goosebumps. He preferes "action stories."